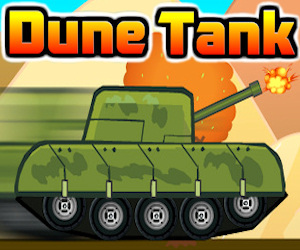 Description Dune Tank is a cool tank shooting and driving game. Drive with this tank and destroy everything on your path. Shoot (spacebar) and destroy cars or crush them by driving over them. Collect stars to score bonus points. Finish the levels as quickly as you can. There are 10 levels waiting for you. Controls Arrow keys to drive, spacebar to shoot.